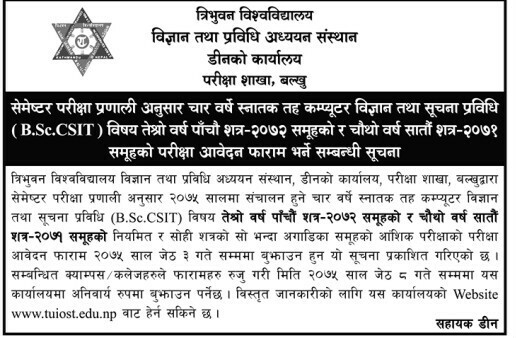 Tribhuvan University , Institute of Science and Technology, Dean office, Examination department Kirtipur has published a notice for semester level examination form fill up for Bachelor of Science in Computer Science and Information Technology (B.Sc CSIT) of: 1. Third year, 5th semester 2072 2. Fourth year, 7th Semester 2071 and partial examinee of previous batches. The date for the submission of the application form is Jestha 3, 2075.